New York City is a popular destination for those who wish to buy or sell silver, as well as other precious metals in the form of coins and other types of bullion. However, as the Big Apple has many coin dealers to choose from, it can be quite hard to find out which ones are the best and worth paying a visit to. If you are only in town for a few days, then doing some research beforehand on the best coin shops in NYC can help you make the most of your limited time. To help you get the most out of your time, or simply help you decide which shops to visit, we have chosen our three favourite coin shops to get you started off on the right track. Ross Precious Metals, or RPM as they are often known, is located in the heart of the city’s diamond district. First opened in 1974, they have been around long enough to weather many storms in the world of investing in precious metals and are still here to tell the tale. Not only do they buy and sell silver and other precious metals as well as gems, they also provide a refining and assaying service to help you determine the quality and value of your goods. The staff working at RPM is very knowledgeable and helpful when it comes to assisting you in making a decision or when simply doing research. If you are based in NYC or are just visiting, this coin shop and more should be on your must-see list. Bullion Trading LLC is located in the heart of the city and currently has a modest selection of silver and rounds from around the world. Their prices are comparable with online only retailers and picking up an American Eagle in person will cost you about the same as buying from an online coin dealer. While their selection isn’t as big as some of the major online dealers, you do get all the benefits of shopping in a coin store as opposed to buying online. Also, to keep costs down, they prefer to stock coins that are in demand and are moved on quickly, preventing them from sitting on stock which most people won’t be interested in. This store has been family owned and operated for 50 years and is a treasure trove of sports memorabilia and rare coins, as well as gold and silver bullion. Visiting Brigandi Coins is always an exciting trip as you never quite know what you will find in store. 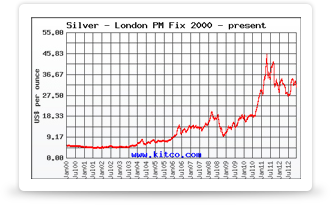 When it comes to buying silver coins, they have the main, most popular coins on offer as well as bags of junk silver. Bars are available in sizes from 1 Oz. right up to 100 Oz. so whatever your budget, there should be something to match it. The state of New York has a sales tax of 4% and the City also has a sales tax which is set at 4.5%. Together, with the Metropolitan Commuter Transportation District surcharge of 0.375%, the total sales tax for NYC is 8.875%. Due to the application of sales tax in New York City, it is not a suitable place to make out of state tax free silver purchases (unless you purchase $1,000 or more of bullion, at which point you are exempt from sales tax).